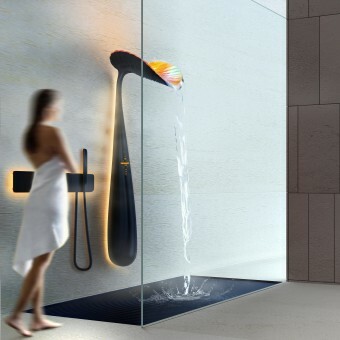 A shower panel that has not yet combined such possibilities within so pleasant aesthetic appearance, as well as a shower tray with a system of accumulation and filtration of gray water. Such duet is designed to cope well with the over-use of water, not so much systematically in itself as much to take part in the distribution of water balance in the general living space for whole family or social usage and will save 50% - 70% of the fluid used. 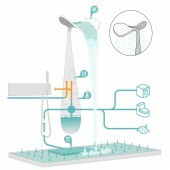 For convenience of the User the system is equipped with the ability to connect to the "Smart" space, which will allow this equipment constantly register spending and consuming the resources, making the necessary adjustments for pleasant shower time of a User and distributing (forwarding or redirecting or keeping) necessary amount of water in the system of circulation, irrigation or heating. The body of the shower hanger is made of durable, heat-resistant mineral acrylic resins, which do not require special care. 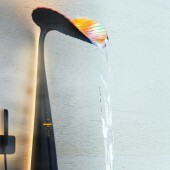 The upper part of the watering can is made of colored glass, formed in the likeness of a leaf of a tropical plant, which is gently illuminated from the inside. The tray is made of the same material as the shower hanger, with a water absorption capacity of about 60 liters, depending on the pallet sizes selected by the user. The surface of the tray can have an unusual and at the same time an interesting visual structure. The essence of the project is to display the aesthetic image of one of the elements of sanitary equipment with the functionality of its use, as well as the introduction of Nano and Smart technologies. To create compatibility of these components, the recommendations and calculations of electrotechnologists were required for the possibility of installing compact electronics, sensors for the mutual coordinated work of each of the zones responsible for the corresponding action in particular or for the entire system as a whole. Searching for the desired shape and simplicity of the lines mainly depended on the conclusions of the research (equipment capacity, all kinds of connections).Besides some difficulty was caused by the necessity to find the proper place for the gray water cleaning system. This led to a simple approach - to install it using the space of the shower tray, so as not to occupy the useful area of space for these purposes. Copyrights belong to Polikarpov Vladimir, 2017. Ora Shower Panel by Vladimir Polikarpov is a Nominee in Bathroom Furniture and Sanitary Ware Design Category. · Click here to register today inorder to be able to view the profile and other works by Vladimir Polikarpov when results are announced. Ora Shower Panel by Vladimir Polikarpov is Winner in Bathroom Furniture and Sanitary Ware Design Category, 2017 - 2018. · Press Members: Login or Register to request an exclusive interview with Vladimir Polikarpov. 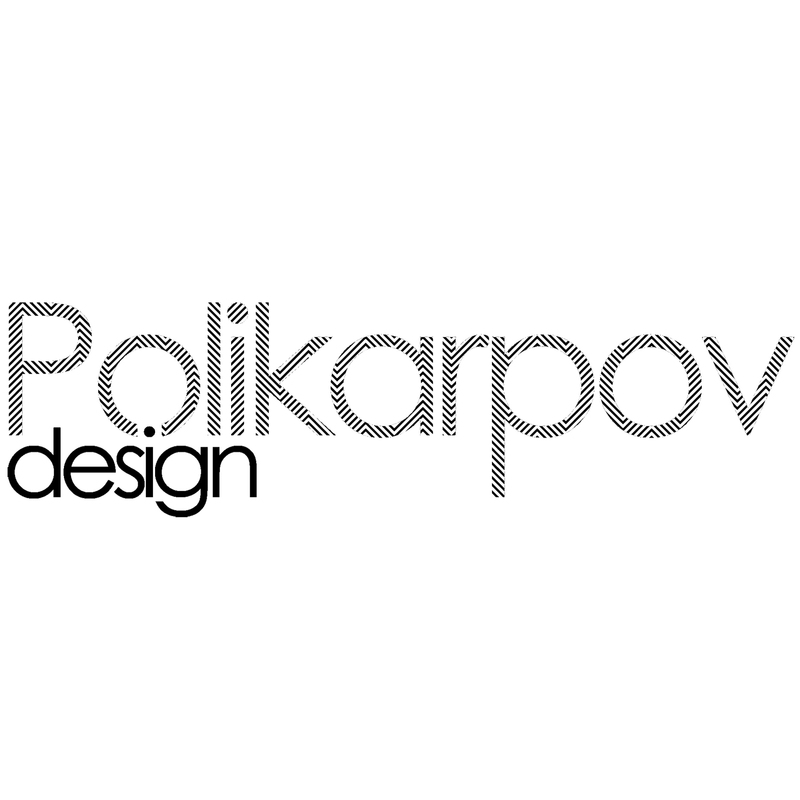 · Click here to register inorder to view the profile and other works by Vladimir Polikarpov. Did you like Vladimir Polikarpov's Sanitary Ware Design? Did you like Ora Shower Panel? Help us create a global awareness for good sanitary ware design worldwide. Show your support for Vladimir Polikarpov, the creator of great sanitary ware design by gifting them a nomination ticket so that we could promote more of their great sanitary ware designs.